T he views are grand, the slopes green with prosperous-looking vines. I wouldn't guess that this Bennett Valley estate has endured such a share of rocks thrown its way. The first crop came in 2003, just as a tremendous grape glut was underway. Then, as soon as they released their own "Dry Stack" label, lawyers representing Dry Sack Sherry persuasively "suggested" that they change their name—just to make certain that a few hundred cases of Sonoma County product wouldn't take market share from a mass-produced kitchen cupboard wine. Now, sales of Syrah, which promised to be the "next big thing" when they planted, have stalled out. Yet Grey Stack forges ahead, because this is a choice spot for growing cool-climate Rhône-style wines. How cool? Dry Stack Vineyard (they only had to rename the wine, not the land) lies directly in the path of an arrow of fog that the ocean regularly shoots through the Petaluma Gap to hit Bennett Valley like a bulls-eye. Even when fog is not visible, cool breezes blast through Crane Canyon. Syrah dramatically reflects local conditions, the terroir—but unlike Pinot Noir, it doesn't just fall apart outside of its comfort zone—it keeps on going, from hot and jammy Australian-style "Shiraz" from Alexander Valley, on down to brooding, earthy styles from cooler climes. Before planting in 2001, Grey Stack's Peter and Marie Young spent a few weeks in the Rhône Valley, which convinced them to go with Syrah. They pulled out a 4,000-yard pile of rocks in the development process; the crew in turn made rock walls from the pile, using the old mortarless "dry stack" method of fitting rocks together. Hence, the now-gone name. The 2008 Rosemary's Block Sauvignon Blanc ($28) is a nice lean style with teases of toast and tropical fruit; half barrel-fermented, it's got understated flavors of lemon drop and pineapple. The 2006 Marie's Block Syrah ($38) is sensuous and leathery, with hints of bacon fat and a few hairs of horse, sprigs of mint and rosemary, warm red berries and a dry—not drying—finish. The 2006 Narcissist Syrah ($48) is basically the same wine with more and darker oak, which ties down the mineral-soaked fruit, and needs time to open up the other aromas. The 2007 Folly Syrah-Grenache ($32) is so-called for "Peter's Folly," when he hastily harvested three weeks before his clients' grapes. Guess what? Pick early, you don't get disaster—you get France. Dark aromas of saddle, beef stick and savory herbs dominate black cherry and roasted beets, with a gentle shadow of tannin. The Youngs were advised that heat-loving Grenache wouldn't ripen until Christmas; if this isn't ripe, it is enticing. Marin County's Broc Cellars makes a single varietal wine from their share of the winery's Grenache; the deep garnet wine starts off dusty and sultry, opening to black cherry and licorice with air. Dried red cherries and cayenne pepper heat the tongue, finishing fine and dry, a slight herbal astringency with an echo of playa absinthe. For current and future fans of the wild, earthy fruit of the Rhône, Sonoma-style, this is Christmas. Grey Stack Cellars, 4100 Grange Road, Santa Rosa. By appointment only. 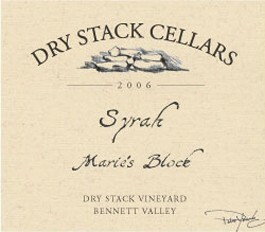 For tour or tasting info, call 707.228.1338 or visit drystackcellars.com.